To Cite: Moradimajd P, Asadi Noughabi A A, Zolfaghari M, Meran A. Effectiveness of Multifactorial Intervention on Observance of Physical Restraint Standards of the Patients Hospitalized in Intensive Care Units, Crit Care Nurs J. 2016 ; 9(2):e6359. doi: 10.17795/ccn-6359. Background: One of the important duties of nurses is to protect patients against any injuries. In most cases, physical restraint is applied as one of the immunity tools. In cases that other actions are not possible, physical restraint seems to be one of the acceptable interventions to protect patients or personnel of the unit. Objectives: The current study aimed to assess the effectiveness of multifactorial intervention on observance of physical restraint standards of patients hospitalized in intensive care units. 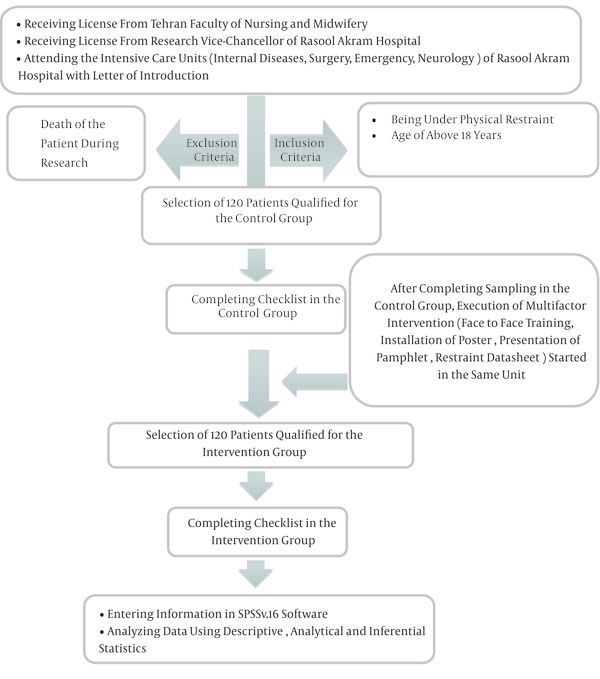 Patients and Methods: In this clinical trial study, 240 patients under physical restraint and hospitalized in intensive care units of Hazrat Rasool Akram hospital were studied in two control and intervention groups with convenience sampling. Observance of the physical restraint standards was first recorded with observational checklist. Then, the multifactorial intervention (education through pamphlet, installation of poster in the unit and physical restraint datasheet) was executed for one month. After that, observance of standards was recorded and compared with that of the control group. The collected data were analyzed using SPSS v.16 software with independent t-test and Chi-square test. Results: The findings showed that observance of physical restraint standards in the control group was undesirable in more than half of the patients (56.7%) and relatively desirable in the intervention group for the majority of the patients (73.3%). Result of independent t-test showed statistically significant difference in observance of standards between the control and intervention groups (P value < 0.001). Conclusions: Considering the obtained results, multifactor intervention increased the observance rate of physical restraint standards for patients hospitalized in intensive care units. As a result, it is suggested to use multifactor intervention (education to personnel, recording restraint and installing poster) to improve immunity of patients and reduce the side effects of physical restraint in intensive care units. One of the important duties of nurses is to protect patients against any injuries (1-3). This issue can be a challenge for the nurses of intensive care units (ICUs) who should create an immune environment for patients with agitation and delirium (4). More than 80% of the patients in ICUs may experience some degrees of agitation and delirium during the term of hospitalization (5, 6) which is due to pain, systemic diseases, sleep deprivation, hypoxia, mechanical ventilation, myocardial ischemia, alcohol and drug deprivation and change in cellular metabolism (7). Agitated patients may be constantly restless and some symbols such as mobility, pushing edge of the bed, taking invasive tools and cutters, trying to leave the bed, throwing and beating and may be due to not being aware of time and place (4). In cases that other actions are not possible, physical restraint seems to be one of the acceptable interventions to protect patients or personnel of the unit (8, 9). In most cases, physical restraint is applied as one of the immunity tools. The main reason is to protect the patient from falling (10-13). The extent of using physical restraint in the ICUs is 24% - 40% higher than that of the general units (1). Although there is the primary tendency to use physical restraint to protect the patient, many negative and harmful effects of its use are reported (14). Use of physical restraint is accompanied by many complications and negative effects such as bed sore, depression and death (9); but improper and unprincipled use of physical restraint can create injury with different intensities sometimes leading to death (8). In the past, nurses commonly used their clinical judgment about restraint of patients. Although this problem had different reasons such as case report of choking and injury as a result of restraint, standards for using physical restraint are limited (15). Although most of the acceptable standards are considered to use physical restraint, this technique is related to physical, psychological, ethical and legal problems and complications (16). Despite different reports of physical restraint complications, unfortunately, only a limited number of health researchers and personnel pay attention to the problem of using physical restraint (17). Now, considering that physical restraint is commonly used in ICUs and the execution of technique and observance of standards to prevent complications caused by physical restraint are important based on the previous observations, and since the standards of restraint are not observed properly, the current study aimed to assess the condition of physical restraint standards in ICUs. The present clinical trial study included all patients hospitalized in ICUs of the selected hospitals of Teheran University of Medical Sciences in 2012 - 2013 and 240 patients (120 patients in the control group and 120 patients in the intervention group) were selected among those hospitalized in ICUs who were under physical restraint at the time of research using the convenient sampling method. Data collection instrument was the checklist prepared using reliable scientific sources. To confirm the scientific validity of data collection instruments, content validity method was used and tens of faculty board members confirmed them. The checklist comprised of two sections. The first section was related to demographic characteristics and information relating to the disease of the studied units and the second section was related to physical restraint standards. This checklist had 20 items among which items 1 - 8, 9 - 13 and14 - 20 were related to the period before restraint, during restraint and the period of using physical restraint, respectively. In this checklist, any item was marked based on three options “observed”, “not observed” and “not applicable”. At the end, the score of each stage was calculated separately, based on the rates. In this way, the researcher explained the goal and manner of conducting the research to the qualified people after receiving the license from ethics committee of Tehran University of Medical Sciences and letter of introduction to the research site; the informed consent letters were signed by the participants or their caretakers. The researcher attended the ICUs and completed the checklists based on his observations. Inclusion criteria of the samples were age above 18 and undergoing physical restraint. Then, multifactor intervention was executed for one month in the intensive care units. To execute multifactor intervention, physical restraint standards enacted by nursing organization and the guidelines related to the physical restraint of the patients hospitalized in ICUs were specified. Execution of physical restraint was in such a way that educational materials related to the definition of physical restraint and its applications, selection of physical restraint instruments, standard and proper use of physical restraint, necessary care during the use of physical restraint, manner of recording duration of the use of physical restraint were prepared as posters and educational pamphlets. Educational posters were used in all four ICUs and educational pamphlets were also given to nurses and other people who played a role in the trend of physical restraint of the patients. The researcher participated in the studied ICUs and three times presented trainings to the personnel individually and face to face to observe physical restraint standards. A form was given to the head nurse of the unit to record physical restraints (type of restraint, the restrained organ, cause of using restraint, sedative medicines used for patient and controlling heartbeat, temperature and change in color of the restrained organ) to be used for patients under restraint. The manner of recording information in this prepared form was also explained to the head nurse and other personnel of training section. The physician of the ICU was asked to record the requests for use of restraint in patients` files. In trainings, the necessity of receiving letter of consent from patients or their companions to perform physical restraint was emphasized. After one month and giving necessary trainings to the ICU nurses, a trained person was selected as assistant researcher to ignore the effect of the researcher’s attendance on performance of the nurses regarding observance of physical restraint standards toward the patients. The assistant researcher attended the studied units and completed checklists related to observance of physical restraint standards until the intervention group samples reached the predetermined size. To analyze the research data using SPSS v.16 software, descriptive and inferential descriptive statistical methods and independent t-test were used. In the current study, 240 patients were studied (120 patients in each group). Independent t-test and Chi-square test showed that the studied subjects in the control and intervention groups were in the similar conditions in terms of gender, level of consciousness and hospitalization unit but they were different in terms of age. For this reason, the extent of observance of physical restraint standards was mentioned in Table 1 based on the age groups to control age variable. Independent t-test showed statistically significant difference in terms of observance of physical restraint standards in the control and intervention groups. The extent of observance of physical restraint standards increased in the stage before restraint and during the term of using restraint in the control group compared with that of the intervention group and the difference was statistically significant (Tables 2 and 3). But the extent of observance of physical restraint standards did not increase considerably during restraint and the difference was not statistically significant. Considering the results of independent t-test in age groups, it was conclude that age was not regarded as an intervening factor in the control and intervention groups. In other words, intervention in all age groups was positively effective. aTest result: t = -5.758; df = 210.68; P value < 0.001; significant. bValues are expressed as No. (%) unless otherwise indicated. aTest result: t = -1.719; df = 238; P value = 0.08; not significant. Intensive care unit (ICU) is the unit in which there is more prevalent use of physical restraint (14) and this is almost an acceptable performance. This issue is contradictory to different supervisions and standards related to the reduction or prevention of physical restraint in other health-therapeutic centers (18). Nurses used physical restraint as a part of therapeutic methods in different units for many years (19), but the use of physical restraint technique is a controversial issue (20). There are many concerns about the safety and effectiveness of this technique (21). Findings of the current study showed that mean standard deviation of the physical restraint standards of the patients was 47.60 ± 10.97 before intervention which increased to 47.60 ± 11.06 after multifactor intervention. Results of independent t-test showed significant relationship between the two groups and in all age groups (P < 0.001). As a result, the extent of observance of physical restraint standards in the patients after intervention was higher than that of the patients before intervention. The extent of observance of physical restraint standards had statistically significant difference in the stage before restraint in the control and intervention groups and the extent of observance of standards increased at this stage. The cases of communication with patient, explanation of work stages to him, recording the cause of using physical restraint increased in the intervention group. But the physician’s order was not performed in the control and intervention groups. In fact, there was no physician’s order regarding the use of physical restraint. Considering the researcher`s observations, physicians of ICUs regarded the use of physical restraint as unprincipled for patients and did not tend to record physical restraint and request for performing it. According to the study by Akansel et al. (22), physician’s order for physical restraint is necessary. Date and duration of restraint should be recorded. Considering conditions of the patient, it should be revised every 24 hours. Unfortunately, this issue was not performed in intensive care units. The sheet of physical restraint designed by the researcher was not accepted by the hospital and the organs were restrained only in the ICU, emergency and neurology wards and the reason to use physical restraint was recorded in the patient’s file after multifactor intervention in the intervention group. The study by Hine (4) reported that physical restraint is seldom recorded in medical and nursing sheet of patients. This issue shows that restraint is not regarded as an important and medical intervention, while recording physical restraint can lead to paying more attention to the patient under restraint and better observance of physical restraint standards. Another study entitled “the use of physical restraint in intensive care units of Korea” conducted by Choi and Song, emphasized on the necessity for the type of restraint, the restrained organ and duration of physical restraint. The results of these studies are in line with those of the present study. Considering the obtained results, physical restraint was not recorded by physicians and nurses in any of the intensive care units. According to the nurses, restraint was not recorded due to fear of legal prosecution and no obligation of the unit authorities. Another case of standards was to receive informed consent from patients or their companions. According to the study by Bandman, although physical restraint is recognized well in recent years, nurses should receive the informed consent from the patients before performing any kind of care procedure. But in the present study, no informed consent was received from the patient or his/her family in any of the studied units. It is probably due to the fact that physical restraint is not regarded as an important medical and nursing intervention. Physical restraint standards are related to the restraint of patients during the procedure. In surgery ICU, 100% of the standards were observed. In other ICUs, pads were not used before putting restraint tools. Despite execution of multifactor intervention and emphasis on the necessity of putting gas pad on the organs before fastening the restraint tools due to failure of the authorities to cooperate and failure to give equipment to the personnel; this standard was not observed in the intervention group while it is necessary to fasten organs with gas pad before putting restraint tools and it is regarded as one of the standards of physical restraint (21-23). Another stage is related to physical restraint standards during the use of restraint. Results of independent t-test showed a statistically significant difference between the control and intervention groups in the mean percent of physical restraint standards observance during the use of physical restraint (P < 0.001) and the extent of observance of standards in the intervention groups considerably increased. Standards of this stage was almost related to care measures required for patients under physical restraint such as checking extremities of the patients to see change of colour, temperature and heartbeat every 30 minutes, active motions and opening and closing physical restraint every two hours. Cares related to restraint were seldom performed in the control group and no special attention was paid to the restrained organ which may be due to unawareness of personnel with the importance of caring the restrained organ, while it is necessary to take care of the restrained organ according to the standards. But in the intervention group and after execution of multifactor intervention, the extent of observance of these standards considerably increased. Generally, the extent of observance of physical restraint standards in the intervention group increased compared with that of the control group. As a result, multifactor intervention was effective on the extent of observance of physical restraint. Results of the study by Smith et al. (12), entitled “the impact of education on the use of physical restraints in the acute care setting” showed that increase in awareness of the health caregivers can promote quality standards of caring patients and improve the results and outcome of the physical restraint. The project execution limitations and reduction methods were failure to accept the restraint sheet due to lack of laws and executive requirements to record the cases of physical restraint and failure of the supervisors of ICUs to insert information of physical restraint in the restraint sheet designed by the researcher. To reduce this limitation, all nurses were consulted to write and record cases of physical restraint in the nursing report. Another limitation was failure of the hospital to organize educational classes for the personnel. To reduce this limitation, the researcher used face to face training method. The effect of the researcher’s attendance on performance of the personnel and the false desirable result was another limitation and the researcher used an assistant researcher to conduct sampling and complete observational checklists. According to the findings of the current study, it is advisable to execute multifactor intervention (education to personnel, recording restraint and installing poster) in ICUs to increase the extent of observance of physical restraint standards and safety of the patients hospitalized in ICUs and to reduce complications of restraint in ICUs. This paper is an abridgment of thesis entitled: “effectiveness of multifactor intervention on observance of physical restraint standards among patients hospitalized in intensive care units” in 2012 - 2013 and under research project code No. 19411 sponsored by Tehran University of Medical Sciences. The researcher appreciates the authorities and personnel of the intensive care units for their cooperation.